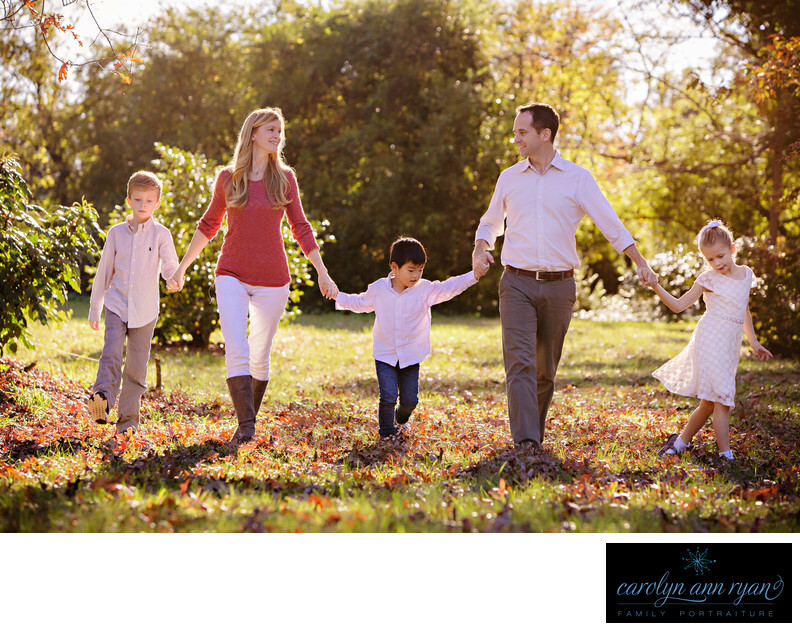 As a new photographer to the Charlotte area, I have to say that I have loved meeting other local area family portrait photographers and they have been so warm and welcoming! We FINALLY had sunshine for their portrait session after weeks of rain and it was so wonderful to be back outdoors with my camera and I had such an awesome time photographing the beautiful family of a fellow Charlotte, NC Family Photographer. We picked Matthews, North Carolina as our location because we knew we would have a combination of an adorable small-town setting as well as parks and nature as our backdrops, but if the ground was too wet, we had nearby sidewalks, benches and more to use. I love the sweetness of this family photograph and being able to see all the charms and personalities of the family. As a typical little girl in a sweet white dress, the daughter seems to be off in her own princess world filled with moments of dancing and twirling in the sunshine, while her younger brother simply enjoys holding Mom and Dad's hands while he explores the ground with his eyes for something to pick up - a rock, branch or dirty leaf, maybe? The oldest brother is possibly thinking about his video games at home, but he still has that little boy sweetness as he chose to hold Mom's hand while they walked through the field. But my favorite part of this photograph is looking at Mom and Dad, as they clearly have a very special connection and mutual adoration that just makes this image perfect in my eyes. When these children grow up, this photograph will remind them just how much Mom and Dad love each other. Keywords: Charlotte family photographer (18), Charlotte family photography (12), Charlotte family portraits (21), outdoor family photography Charlotte (3), outdoor family portraits Charlotte (3). 1/320; f/4.5; ISO 250; 125.0 mm.